What you see above is a chromatography column. It is a glass cylinder with a bulb and ground glass joint on top and a tapered joint with stopcock at the bottom. Using the same principles as TLC, the chromatography column can, with the utilization of the proper amounts of stationary phase (e.g. 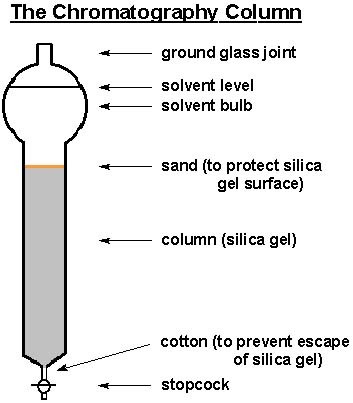 silica, alumina, cellulose), size of column (diameter and length), and type of solvent system, separate various components based on their respective polarities. With the aid of air pressure from the top, one may collect solvent fractions from the column that contain isolated components (purified). This technique is a must for every experimental organic chemist and is one of the most widely used ways to purify compounds from undesired side products. When you fill the column, you can do this using a suspension or the dry powder.In either way, you want to prevent any cracks and air bubbles in the column. Both will deteriorate the quality of separation. The sand on top of the staionary phase serves as a buffer. If you pack the column dry, you need to add the solvent slowly, because the adbsorbent will react with the solvent and liberate heat. The resulting vapors will cause cracks and bubbles in the column. Game over! Generally, you want to use a very concentrated solution of you mixture in a non-polar or weakly solvent solvent. Allow the solution to run down at the side of the column container. Then add the solvent (eluent) very carefully on top. If the solvent (eluent) evaporates before it drips in teh collection flask, use some of the solvent to wash the solid at the tip down. Microscale column chromatography is usually performed in a pasteur pipette. It works the same like the macroscale column chromatography.